Trewarveneth Artists Stay After School. Artists at Trewarveneth Studios, run by the Borlase Smart John Wells Trust who also own Porthmeor Studios in St Ives, are coming together to present a group show. 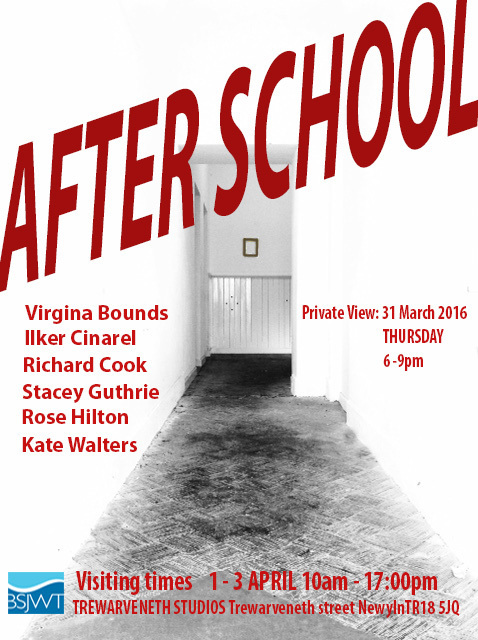 The show named 'After School' , which refers to the building's original incarnation as Trewarveneth Infants School, will see a mix of new and existing work from the artists adorn the walls of the building for three days at the beginning of April. The six exhibiting artists are Rose Hilton, Richard Cook, Kate Walters, Virginia Bounds, Ilker Cinarel and Stacey Guthrie. The show will provide a snapshot of what is happening in one of the most prestigious studios in Cornwall and visitors can expect to see a wide range of subject matter and techniques reflected in the wall-based works. Renowned artist Rose Hilton who was recently made an Honorary Academician for the Royal West Academy is known for work with rich use of colour in a post-impressionistic style. In her career, which has spanned over six decades, Rose has had a solo exhibition at Newlyn Gallery and a solo retrospective at Tate St Ives. Kate Walters, whose recent group show 'Drawing Down the Feminine' is embarking on a tour of the UK and who has had solo shows at Millennium Gallery and Newlyn Art Gallery, uses dreams and encounters with animals 'in ordinary reality and non-ordinary reality' in order to become a 'gatherer of the archaic' and an 'explorer of what is hidden'. Kate's work was used for the album cover of Marc Almond's album 'The Velvet Trail' in 2015. Virginia Bounds, who works from Anchor Studio – built by Stanhope Forbes in the 1880's, recently received major funding from the Arts Council to embark on an eighteen month long programme of professional development. The enabled the making of new work created in response to the landscape and evocative plantings of the gardens at Tremenheere Sculpture Park which was shown in a solo exhibition at the park's gallery. Ilker Cinarel, who has exhibited internationally, with solos shows in London and Istanbul was the winner of Inland Art Festival 2014 People's Choice Award. He works in many mediums, including painting, drawing, performance, sculpture and film to explore his inner feelings of growing up in a patriarchal Turkish family. Questioning the politics that surround the family, through the indescribably personal prism of his own childhood tensions where hyper-macho pop culture spilled over into reality. Stacey Guthrie, winner of the British Women Artists Prize 2013 and selected for Bloomberg New Contemporaries 2014 is better known for her video and moving image work but has recently added painting to her practice. She will be showing new paintings, exploring the domestic experiences of women. These darkly humorous paintings reflect her surreal videos as she examines the cumulative effect of housework over time. The exhibition runs from 1st - 3rd April and is open from 10am – 4pm. There is an opening event on 31st March from 6pm – 9pm where visitors can come and meet the artists and have a drink. Trewarveneth Studios is located at the top of Trewarveneth Street in Newlyn. On-street parking is available nearby. that we can communicate with each other.